Divided into obvious categories like holidays, clothing, food and drink, transport and utilities, it’s easy to find advice on specific areas, so if you’ve identified an area of your outgoings that is in particular need of being trimmed back, you can dip into the book and find what you want quickly. I don’t drive so I was pleased to be able to identify the section I didn’t need, and skip through it to something more relevant to my own lifestyle needs. Lucy, personal finance editor of the London Evening Standard, gives advice which is well balanced and sensible. The suggestion that cycling can be an alternative to using the car for many journeys is countered with a reminder that as cycling becomes more popular, so too the cost of bicycle maintenance and insurance is rising. Neither the content nor the style is ‘preachy’: the pros and cons are put forward and the reader is left to make the decision that is right for him or her. In the same way there’s a warning about supermarket three for two or Buy One, Get One Free offers: they’re great if you’re going to use the products within their use by dates, but think objectively about whether it’s really the bargain they’re trying to persuade you it is. Shopping with others and splitting the cost is suggested as a way of making the most of the savings that can be made by bulk buying. 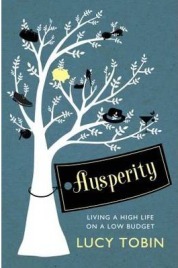 What I really like about Ausperity is the very contemporary take on saving money. Tobin accepts that we’re modern people who want all the accoutrements of modern life but instead of suggesting that we manage without mobile phones, for example, she suggests ways in which we can make paying for them less painful. One idea is to turn down an upgrade and ask whether your mobile provider can give you a more attractive contract instead. Some of the suggestions require a bit of front so they might not appeal to shrinking violets but on the whole there’s very little that can’t be achieved by anyone determined to prune back their expenditure. Tobin also promotes the use of websites such as Groupon and Living Social that offer cut price deals on anything from a weekend in a four star hotel to a cut and blow dry and it’s her inclusion of such references that makes her way of spending less much more fun and way less fuddy duddy than Channel 4’s ‘Super Scrimpers’ series which can often make those trying to save money look like complete eccentrics who don’t live in the century as the rest of us. No, Tobin knows that girls want shoes and holidays and she makes sure that she’s armed us with all the know-how we need to get them for less. Though not specifically written for female readers, there’s nevertheless a sense that this book leans more towards the kinds of things women want to save money on than men might. Tobin suggests registering with mystery shopping companies for jobs anonymously auditing product quality and customer services in restaurants and pubs, giving the impression that in doing so you’ll get a free night out. This was the only area I felt she didn’t quite give the whole picture: as a part time mystery shopper myself, I’m only too aware that many clients now only offer a set amount of compensation for a job, which often isn’t enough to pay for all the items the mystery shopper is required to purchase, and the shopper to make up the rest. Tobin also fails to mention that purchase requirements are also well defined so you may well be asked to buy things you don’t much care for. I wasn’t expecting to get a great deal out of Ausperity for myself and to some extent those expectations were realised. I love bagging a bargain and I’m always on the look out for ways of making an extra quid or two so I’m pretty much familiar with most of the websites that offer freebies, price comparisons, cash-back websites and special deals. The Food & Drink section did contain some excellent advice I hadn’t ever considered before: my favourite was the idea of freezing wine in ice cube trays. I often use wine in a sauce or stew and have a glass with dinner but am left with half a bottle of wine that I stick in the fridge and forget about until it’s undrinkable. Thawed out wine won’t be that great for quaffing, but it is perfectly fine for cooking with. For someone completely new to the idea of saving money this book is a great investment: if you know someone whose outgoings way exceed his or her income then you could do worse than point them in Lucy Tobin’s direction. Seasoned scrimpers might argue that there’s little here that isn’t listed somewhere on Martin Lewis’s Moneysaving Expert website, but the information here is more easily digested and, on a personal level, I find Lucy’s style more engaging. The very best thing, though, about Ausperity is that it is refreshingly empowering; Tobin’s enthusiasm for frugal living, enjoying the free things in life and the joy of getting a good deal on something you really want is infectious and inspiring. Well researched and entirely credible Ausperity lives up to its premise that we can still have what we want but spend less getting it. Not just that, how we achieve that can in itself be fun and satisfying. This is a far cry from your granny’s tips for frugality: I defy even the most dedicated penny pincher to browse this book and not come away rejuvenated and armed with new ideas. With thanks to the publisher for providing the review copy. No Comments on "Ausperity: Live the Life You Want For Less"